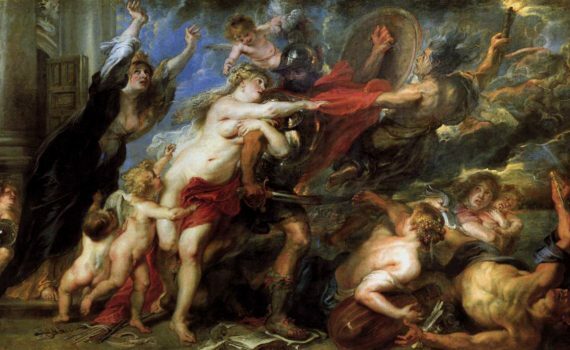 Rubens—a painter to Europe's most wealthy and powerful—is the star. Van Dyck makes painting look easy! His king is just as self-assured—despite having dismounted, he exudes strength. The myth is ancient, but these figures couldn’t be closer. Rubens’s virtuoso brushwork and color are on display. This energetic painting captures the horror of war, from its overwhelming hopelessness to its cultural costs. In Rubens’s hands, leaving a ship becomes a triumphal event—complete with a trumpeting angel. Be still, my heart! A portrait of Marie attracts the king’s gaze, yet our eyes zig-zag around this busy canvas.